As we all knows that current generation is known as the “Mobile Generation”. And the smart phones grew rapidly in the market; the IDC said: “Almost 82.8% market shares the Android Platform only”. So, it will be fair to us that the android application usage is widely over the world. And the android application developer use the IDEs to develop better android application. The Android Studio delivers the better and friendly platform where application developer can design and develop the fantastic and useful android mobile applications. Wow, only the news that proves the Google Group always taking care of developers for better web-application niche presents towards end users. Let’s see one of the basic stuffs that what is the base of Android Studio? Android Studio is based on the IntelliJIDEA and jetBrains software and, it is comes into picture specifically for Android Development; with that the Android Studio is freely available under the Apache License 2.0, which offers the impressive features to developers. The system requirement for Android Studio is basically like… minimum 2GB RAM, & recommended 4GB Ram, JDK 7 or higher, OSs like; Windows, Mac OS, and Linux. Cross-platform and Live coding editor (WYSIWYG). Real – time Rendering and Template based wizards. Allow to do optimized translate. Transparency for usability & its compatibility. Multi – screen configuration provided. Gradle – based build support. Android – specific refactoring and quick fixes. Pro-Guard integration and app – signing capabilities. This all features are normally provided in all the version of Android Studio from the very first. As versions are releases with that the quality of work per version also be improved and ready give you good result every time. As read the features above wanted to know that how the web – applications will be builds & ran successfully? S1: select “Make Project” or .apk file. S2: use the “Build” menu, for application distribution. S3: debug version of your application on an emulator. S4: create and run configuration, now in AS 2.0 the “Instant run”. S5: automatic and manual target modes on AVDs. S6: app will be ready to run on emulator. S7: now, app should be run on physical device. The android app developers are knowingly well the above steps, because for every application above steps must be follow to get successive application at the end. The new IDE is serving the delightful and amazing stabled version of Android Studio 2.0. The As 2.0 delivers the Quick speed almost 2x to 2.5x then the previous releases. Introduce advance Emulator for developer ease. Introducing the “Instant Run” Feature. It will help to grew performance by the flagships releases step by step. Developer can configure custom Android Ecosystem to test applications. Developer can easily emulate the different network conditions and GPS also. Allow to use standard Google Play Services. 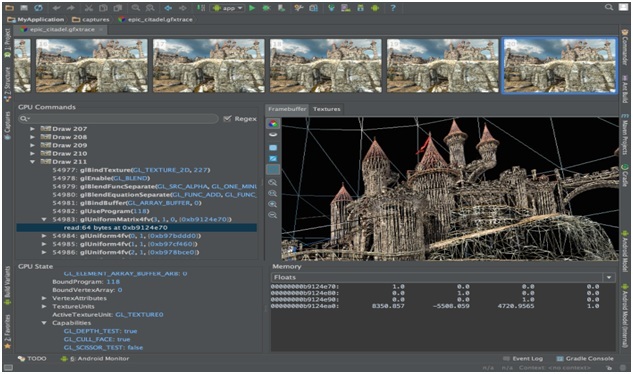 Provide GPU profiler to develop games and graphics. So, thus are the new stuffs of the AS 2.0 or we can say that the features of Android Studio 2.0. At the end, We wanted to say that the use the advance Android Studio 2.0 for your better accomplishment of work of android applications and get the tremendous output. In fact, the Google is also tracking their eyes on “app indexing”, to retrieve the content from applications and sent it to its search engine. By doing this, it will made an help to “Search team” and the result will be enable as feature in new applications. So, the Google is provided the upgraded and already existing entire system in this new version of Android Studio 2.0 to serve qualitative application’s layout. The Android Studio is very useful for developers, they put their best efforts to deliver the fully – featured applications to end users. Just; remaining to do upgrading your Android studio into latest version of Android Studio 2.0 and fill the flexibility, of features by “Instant Run”.